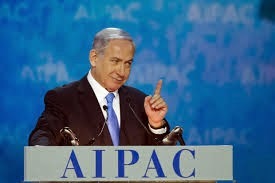 The speech given to AIPAC by Israeli PM Benjamin Netanyahu today was very impressive. It was wonderful that the leaders from Spain, from Canada, and from the Czech Republic attended the speech - providing support to Netanyahu similar to how Aaron & Hur held up the arms of Moses while the Hebrews crossed the Red Sea. Bibi personified grace under pressure as he shone a very good light on President Obama. This was despite the fact that the president and staff have been campaigning against the Israeli prime minister's speech to U.S. Congress. P.M. Netanyahu was in a difficult situation: to keep his word to House Speaker Boehner when he accepted the invitation. More importantly, to the people of the world to expose the probable dangers the negotiations with Iran could produce. With Israel literally the primary target for elimination by Iran, Netanyahu needed to speak up. So, why speak before the U.S. Congress....of all countries with which to present his case? 1) Because Iran has not been shy in it's threats to Israel first, then to the U.S. whom they refer to as "the big satan". 2) Because the United States of America is the least "Israel angry" and most "Israel friendly" in the world. I'm speaking of the people of the United States as well as several in our Congress. As Bibi mentioned in this speech regarding the U.S. - "we're practically mishpocha" (family). It is my fervent prayer and hope that leaders involved in these negotiations will hear the truth of the dangers Iran poses to all of us; just as ISIS poses dangers to all of us. “Thank you. Wow, 16,000 people. Anyone here from California? Florida? New York? Well, these are the easy ones. How about Colorado? Indiana? I think I got it. Montana?Texas? You’re here in record numbers. You’re here from coast to coast,from every part of this great land. And you’re here at a critical time. You’re here to tell the world that reports of the demise of the Israeli-U.S. relations are not only premature, they’re just wrong. I want to welcome President Zeman of the Czech Republic .Mr. President, Israel never forgets its friends. And the Czech people have always been steadfast friends of Israel, the Jewish people, from the days of Thomas Masaryk at the inception of Zionism. You know, Mr. President, when I entered the Israeli army in 1967, I received a Czech rifle.That was one of the rifles that was given to us by your people in our time of need in 1948. So thank you for being here today. And I want to recognize the other Ron, a man who knows how to take the heat, Israel’s ambassador to the United States, Ron Dermer. Ron, I couldn't be prouder to have you representing Israel in Washington. Both Democratic and Republican presidents have worked together with friends from both sides of the aisle in Congress to strengthen Israel and our alliance between our two countries, and working together, they have provided Israel with generous military assistance and missile defense spending. We've seen how important that is just last summer. Working together, they've made Israel the first free trade partner of America 30 years ago and its first official strategic partner last year. They've backed Israel in defending itself at war and in our efforts to achieve a durable peace with our neighbors. Working together has made Israel stronger; working together has made our alliance stronger. 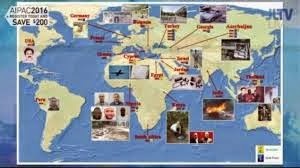 training, arming, dispatching terrorists on five continents. Iran envelopes the entire world with its tentacles of terror. This is what Iran is doing now without nuclear weapons. Imagine what Iran would do with nuclear weapons. You know I think that encapsulates the difference. I've been prime minister of Israel for nine years. There’s not a single day, not one day that I didn't think about the survival of my country and the actions that I take to ensure that survival, not one day. In 1967, as an Arab noose was tightening around Israel’s neck,the United States warned Prime Minister Levi Eshkol that if Israel acted alone, it would be alone. But Israel did act — acted alone to defend itself. In 1981, under the leadership of Prime Minister Menachem Begin, Israel destroyed the nuclear reactor at Osirak. The United States criticized Israel and suspended arms transfers for three months. And in 2002, after the worst wave of Palestinian terror attacks in Israel’s history, Prime Minister Sharon launched Operation Defensive Shield. The United States demanded that Israel withdraw its troops immediately, but Sharon continued until the operation was completed.